This screen is almost identical to a screen of the same subject and composition by Maruyama Okyo (see lot 113). The artist was presumably a followers of Okyo. 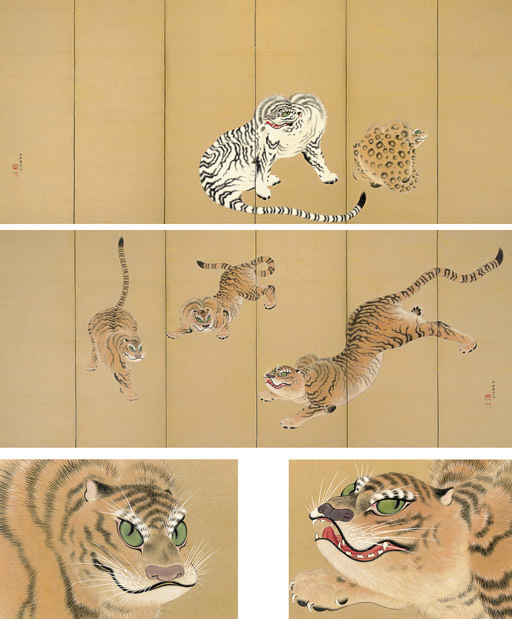 For Okyo's tiger screen, see Osaka Municipal Museum of Art, Mainichi shinbunsha and NHK, eds., Tokubetsuten Maruyama Okyo--Shaseiga sozo eno chosen/Special Exhibition Maruyama Okyo: Shaseiga--Challenging a New Frontier (Tokyo: Mainichi shinbunsha and NHK, 2003), pl. 58.